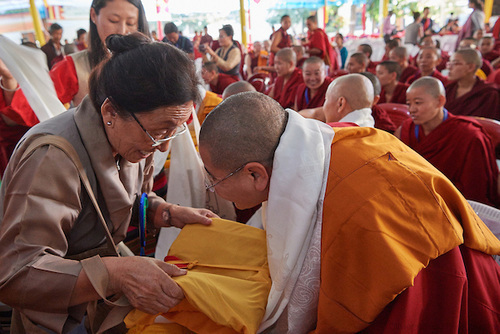 The Dolma Ling Nunnery and Institute hosted 46 nuns taking their 'Geshema' exams from August 15-26. 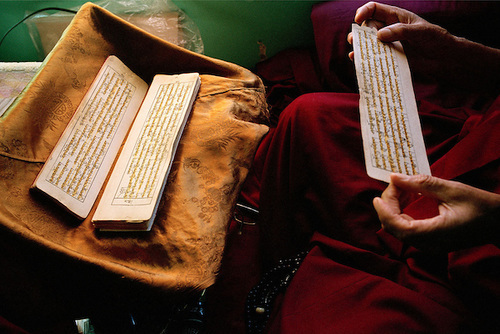 The four-year 'geshe' degree is considered the highest academic degree in Tibetan Buddhism, the equivalent of a PhD. It has been six decades since he escaped into India and established a government in exile, and two since he was awarded the Nobel Peace Prize, but His Holiness the Fourteenth Dalai Lama still faces the charge that the Buddhist tradition he represents does not give nuns the same rights as monks. The allegation is not unfair. Of the eight representatives of Tibetan Buddhism in the Parliament-in-exile – two each from the four sects of Gelug, Kagyu, Sakya, and Nyigma – all are monks. The two members from the pre-Buddhist Bon religion are also men. Tibetan Buddhists are not alone. Among the Theravada Buddhist traditions in South and South-East Asia, for example, Sri Lankan nuns have been refused official identity cards in their ordained names, and the Thai Buddhist Council denies legitimacy to the process of ordaining women. However, a month after the celebrations of his 83rd birthday, another significant celebration was under way in the village of Sidhpur near the Dalai Lama’s home in Dharamsala, which had him to thank for it. It was exam time in Dolma Ling Nunnery and Institute, which hosted 46 nuns taking their Geshema exams from August 15-26. The four-year “geshe” degree is considered the highest academic degree in Tibetan Buddhism, the equivalent of a PhD. Only monks could enroll in the program until 2012, when the Dalai Lama supported a decision to make it available to nuns for the first time in history, ending years of deliberation among representatives from Tibetan nunneries, the Institute of Buddhist Dialectics and the Tibetan Nuns Project. It requires over 17 years of monastic training to be eligible for this course of study and very few nuns had come that far until recently. For the first nuns who escaped to India, such academic achievement was unimaginable. There were by far fewer nunneries than monasteries in Tibet, and 99% nuns who arrived as refugees had received no formal education. Many could not even write their names. By contrast, the monks who accompanied and followed the Dalai Lama often came from firmly established institutions, which enabled them to re-organise in exile around their former affiliations. The nuns came in smaller numbers and from disparate backgrounds. Many had nowhere to go. Fearing that they would not be able to keep their religious vows, some felt surrendering their robes was the only option. This is sadly ironic given the risks involved not only in the arduous escape to India, but also in choosing monastic life. The Dalai Lama was a key patron of Sakyadhita: International Association for Buddhist Women, which was founded in 1987 in Bodhgaya. Literally meaning “daughters of the Buddha”, it facilitates global connections among Buddhist women, nuns in particular. It aims to “work for gender equity in Buddhist education, training institutional structures, and (monastic) ordination”. Its founders include nuns from Tibetan, Sri Lankan, Thai and Zen traditions. The journey of Tibetan Buddhist nuns from illiteracy to the geshe degree took place within this international conversation among different Buddhist traditions, and between Buddhists and the rest of the world. Closer home, its most important advocate was the Tibetan Nuns Project (TNP), instituted in the same year as Sakyadhita, sharing many of its concerns. It’s founder and director Rinchen Khando Choegyal is the Dalai Lama’s sister-in-law. Several western women joined the TNP as staff and volunteers around this time and since, some have also become Tibetan Buddhist nuns. Many – like TNP co-director Elizabeth Napper and Sakyadhita co-founder and professor of religion venerable Karma Lekshe Tsomo – hold advanced academic degrees. These women emerged as front-runners in demands for gender parity for nuns in international fora. 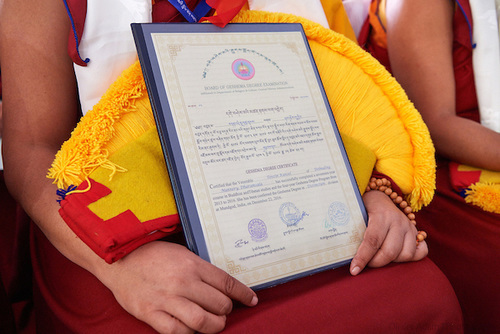 Two years before the geshe program was introduced for nuns, the Institute for Buddhist Dialectical Studies in Dharamsala conferred the first geshema title upon the German-born Kelsang Wangmo in April 2011, clearing the way for others. I spent the summer of 2004 at Dolma Ling Nunnery as a fellow in the Gurukul program, and have gone back almost every year since. 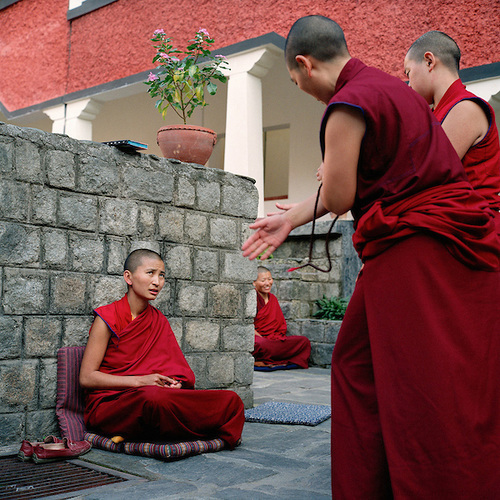 During this time, I have seen how, far from being a monochromatic experience of dislocation and loss, the six-decade long exile in India has paradoxically proven to be an opportunity for Tibetan nuns. Raising support among patrons and potential sponsors in Europe and North America led to an articulation of their concerns in the language of feminism and rights. This in turn led to pedagogical and curricular innovations in nunneries – the inclusion of subjects like English, computer training and videography – and the demand that nuns’ education be on par with monks’. Three generations of life away from home also led to the reconfiguration of an old divided Tibet into the imagined unity of the new Tibet. As a result, sectarian hierarchies within Tibetan Buddhism became less relevant. TNP supports nunneries from all four sects and its model institution Dolma Ling Nunnery is non-sectarian. On the flipside are the dangers of appropriation, generalisation and misrepresentation. In her book Buddhist Nuns and Gendered Practice (2013) on the movement for full ordination of Sri Lankan nuns, Nirmala Salgado, professor of religion at Augustana College, contends that “the narratives of contemporary Asian nuns have yet to be appreciated on their own terms”, which are specific to each tradition and location. Such transnational projects of “women’s empowerment” and “equal rights” could end up treating the position of women within Buddhist monastic orders as a problem that (western) liberal feminism can solve. Foremost among curricular changes was debating, which is an important component of the geshe exam. Philosophical argumentation is commonplace in Buddhist traditions and can be traced all the way back to debates in ancient India between proponents of the Hindu orthodoxy and their various heterodox opponents, including Buddhists and Jains. But it had not been customary for nuns to train in philosophy or debating. In addition to including these subjects in the curriculum, in 1995, the TNP instituted the month-long debating festival Jang Gonchoe, which is modeled on the annual winter debate at Jang (west of Lhasa) among the great monastic institutions of Tibet. The absence of established curricula provided more freedom for innovation and standardisation. This ensured that nuns from vastly varying levels of prior education and age, hailing from different sects, were all trained in logic and epistemology, the perfection of wisdom, the middle way and tantra. The same was true for Lobsang Dolkar. As a nun without a nunnery in Tibet, Dolkar attended to household chores and livestock. Being a nun had meant reciting mantras and doing prostrations. In exile, she was among the first batch of nuns who (literally) built Dolma Ling Nunnery in the 1990s. Despite her fears about its difficulty, she embarked on the geshema program to set an example for younger nuns. And it’s the younger ones who might get to practice among the sangha of fully ordained nuns – Tibetan Buddhism’s glass ceiling – a lineage that has been broken for almost a thousand years. In March 2017, Ogyen Trinley Dorje, one of two claimants to the title of the Seventeenth Karmapa, took the first steps towards its revival. The Tibetan word “geshe” comes from the Sanskrit term “kalyaṇa-mitra”, literally meaning a ‘virtuous friend’ or someone who can act as a reliable spiritual adviser. The degree makes nuns eligible for teaching and other leadership positions within lay and monastic institutions. Many join schools and nunneries in Tibetan settlements across India, as well as in Tibetan speaking regions like Ladakh and Spiti. The first batch of 20 geshemas, from five nunneries across India and Nepal, graduated in 2016, followed by six in 2017, and ten who took their final year exams last month. I too enrolled in a PhD program the same year as the first batch of geshema nuns and we jokingly speculated about who would be first to reach the finish line. I am beyond delighted to report that my virtuous friends have beaten me thrice over! 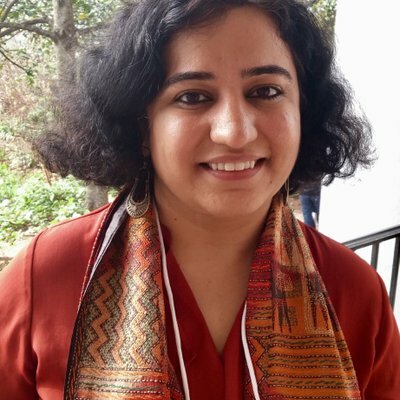 Swati Chawla is currently a fellow at the American Institute of Indian Studies, and a PhD student in history at the University of Virginia. As a grandchild of partition refugees, she has always been curious about how people make their homes in new places and is currently exploring the question through her dissertation on nationalisms and claims of citizenship in the Himalayan regions of postcolonial South Asia. Tweets @ChawlaSwati.